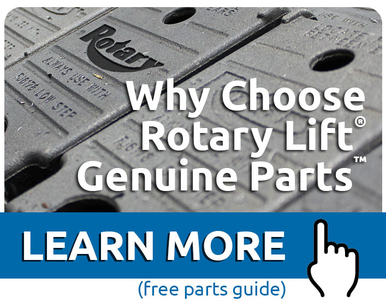 Rotary Genuine Parts: The RAI network uses Rotary Genuine Parts when repairing lifts. These parts are designed to withstand Rotary's rigorous testing and ensure the lift the RAI is repairing meets ALI/ANSI safety requirements. Rotary Authorized Installer Network: The RAI network is factory trained on Rotary product, equipped to complete ANSI lift inspections, and has the ability to repair lift brands other than Rotary Lift. The RAI network is insured at the local level and backed up by Rotary's own insurance policy to meet your insurance requirements. Our goal is to make the lift installation and repair process a seamlessly flowing system that exceeds safety requirements, does not interfere with your ability to repair vehicles and meets your goals to reduce cost, improve technician safety and eliminate downtime at every facility.